Spend $100 or more (any items) at our new store on Bonanza (check it out!) and receive 10% off your total order! Alias Smith & Jones Fan Fiction Archive – Gen stories written by a number of different writers, all archived in one handy-dandy place for fans of this wonderful Western series. There is also an Alias Smith & Jones Adult Fan Fiction Archive! Since I had to upload so much of these sites again anyway, I completed the move off of AOL and all of the stories we host are now on our own server. I also updated some author’s email addresses. I have some story updates to make and hopefully those will be done shortly. Amazon Storefront — Books, DVDs, CDs, Action Figures, Comics, and so much more. Artwork by Leah Rosenthal — The main jumping off point for Leah’s various wild and wacky cartoons or lovely serious drawings. 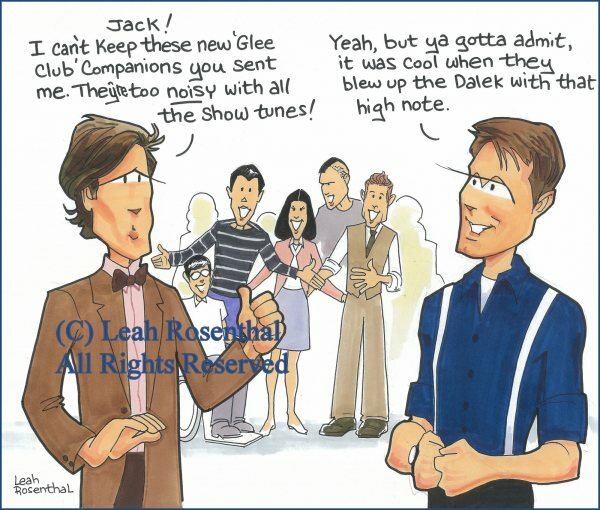 You'll also find links to some of our other artwork/cartoon sites for Highlander, Supernatural, Stargate SG-1, Blakes 7 and other shows as well as all the news and updates about Leah’s artwork. 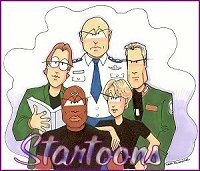 We’ve added lots of new cartoons over the last few months, so check out the Toonarama, Supernatural and the Startoons (Stargate) sites! Ashton Press Fanzine Feedback Site — Rather self-explanatory. A site with letters of comment that we’ve received about our various fanzine publications. We’d love to hear from more of you and so would the authors and artists involved! Ashton Press FanQ Site — Thank you to all of you who nominated and voted for Ashton Press publications, artists and authors for Fan Q awards in 2003 and 2004! We were honored to see our zines and contributors nominated and/or winning in the Highlander, Stargate and Multi-Media categories. Ashton Press winners are all listed at our FanQ Site. Congratulations to all the winners in every category! Bizarro — At this site, you'll find artwork and text relating to Bizarro 7, the humorous Blakes 7 universe created by Leah Rosenthal & Ann Wortham. Bizarro Cattery — If you want to see some of the most beautiful cats in the world, including a gorgeous, exotic breed called the Somali, have a look at our cattery site! Lots of photos of our American Shorthairs (blue tabbies, silver tabbies and brown tabbies), our Somalis (reds, blues and ruddies) and our beloved Household Pets. Book Reviews/Recommendations — Book reviews related to fan series such as Highlander, Blakes 7, Babylon 5, fannish activities, and other subjects that fans might found of interest such as ancient history, mythology, Celtic lore, and so on. Calendars from Ashton Press – Currently available: Stargate SG-1 cartoon calendars, two Highlander cartoon calendars, two multi-media cartoon calendars, two Michael Shanks photo calendars, Adrian Paul, and two Peter Wingfield photo calendars. Customizations always available. Brand new designs now available for 2006 and more on the way!!! Clan MacMeow – A site dedicated to photos of Highlander fan’s furry cat friends. The Daniel Friendly Zone — A site full of buttons and banners and links for fans of the character of Daniel Jackson as portrayed by Michael Shanks and James Spader. Recent updates include new banners and lots more links to Daniel Friendly sites. “Danny” Bears — Bears that are dressed to look like Daniel Jackson from Stargate. There are photos on this site of my own collection of bears of many kinds. But all the ones left to purchase are gone at this time. Donan Woods — Devoted to the character of Cassandra from Highlander: The Series. The page features links to web fan fiction, reviews of zine fiction, links and articles on witchcraft and paganism, information on the ancient Celts, a Cassandra timeline, information on ancient Egypt, herbal lore, photos and convention information about Tracy Scoggins and more! Ebay Store — Our auctions often feature out-of-print fanzines (Star Wars, Kung Fu: The Legend Continues, Forever Knight, Blakes 7, Highlander, Indiana Jones, Battlestar Galactica, and much more! ), photos (including candid shots of the stars), books, videos, Disney items (including pins), coins, stamps, action figures and much, much more. Fan Fiction — Stories written primarily by Leah Rosenthal & Ann Wortham. We are also hosting a few stories by other folks, some new, some old, as well as stories co-written by Ann Wortham and/or Leah Rosenthal with other people. Most of the stories at this site are long out of print and not available elsewhere. Fandoms you’ll currently find on the site: Stargate SG-1, Highlander, Alias Smith & Jones, Blakes 7 and Beauty & the Beast. You'll also find a story index here of where to find the various stories written by Leah Rosenthal and/or Ann Wortham over the years. Fan Fiction by Leslie Fish — Highlander stories written by Leslie Fish. Fan Fiction Recommendations — This page lists some of our favorite Highlander writers to be found on the internet. It is not a review site. If you don't want to read critical reviews (which might be good or bad) but simply want recommendations, this is the place for you. It's also a nifty place to find links to some of the best Highlander writers around (in our opinion, of course). The recommendations are not limited to writers of Cassandra stories. (If you do want to read reviews, check out our Reviews at Donan Woods.) We've expanded this site to include recommendations of writing in other fandoms besides Highlander, including Buffy The Vampire Slayer, X-Files and Blakes 7. We also added some new Highlander recommendations! Fanzines from Ashton Press — We have zines available in many different fandoms, including Highlander, Supernatural, Stargate Atlantis, Miami Vice, Blakes 7, Man from UNCLE, Stargate SG-1, Rat Patrol, Star Wars, Alias Smith & Jones, the Western genre, and multi-media. We carry both adult and "gen" titles. At this link you'll find details about all of our zines, including excerpts of text, samples of artwork, and descriptions of zine contents. We’re accepting submissions for a whole slew of new Stargate zines, including some brand new titles. We’re accepting submissions for Stargate SG-1, Stargate Atlantis, Supernatural and Boston Legal zines and we also can publish stand-alone novellas or novels! Favorite STARGATE SG-1 Links — Links to lots of Stargate sites you might enjoy. Fun Links — Click here to go to some fun fannish links you might enjoy! Hellhound — This is a special site devoted to the Hellhound Blakes 7 universe that has been published in numerous issues of Ashton Press zines over the years. You'll find a story index, timeline, artwork, text excerpts, articles relating to Hellhound, reviews and the like here. Highlander Holy Ground Forum Mid-Week Challenges — The Mid-Week Challenge archive has been heavily updated up through November, 2002. The Christmas entries from last year are also at the Holiday Fan Fiction site. I’ll get caught up eventually! Holiday Fan Fiction — Stories from various fandoms, including Stargate SG-1, Blakes 7, Highlander, The Sentinel, Magnificent Seven, Enterprise, Alias Smith & Jones, The Real Ghostbusters and many more. If you have a holiday story you’d like us to host or to link to, please let us know! This site will be available year-round and I am happy to accept updates for it at any time. Our Stargate Discussion Forum — Come visit us to see our redesign with lots of interviews with cast and crew, convention calendar, convention photos and reports, and more. A Delphi discussion forum for all aspects of Stargate and “Classic” Stargate SG-1. We now have links to chats with Stargate celebrities, interviews, VCR Watch, ratings, spoilers, episode polls and much more. This site is updated quite often with chats, interviews, Q&As, and more. Photos — Latest conventions added (complete with artwork, photos and con reports): TulsaTrek and Vulkon SciFi (see banners at top). Coming soon: Burbank and Gatecon 2004, as well as others! You'll find lots of links to our various photo sites here. Shamelessly Shanks — A site with pretty pictures of Michael Shanks (and a few of James Spader on the way, too!). Unashamedly shallow drooling material. Screen caps from Andromeda, All Around the Town, The Test, Twilight Zone and Door to Door with more on the way. Submission Guidelines — If you are interested in submitting stories or artwork to some of the upcoming fanzines, click here to view our submission guidelines. We also host a small bit of fiction by other authors on our Donan Woods website, on our Ashton Press fan fiction site and lots and lots of authors at our Holiday Fan Fiction site, our Mid-Week Challenge site and our Alias Smith & Jones archive. We're looking forward to hearing from you! Come visit a Stargate Forum by and for the fans of “Classic” Stargate: Our Stargate! Comments about the pictures or the site? Please email us!